Do you use transit to get to work, school or do your shopping? Do you wish you could? What kind of community infrastructure and housing would you like to see built near transit stations in LA? ACT LA will be collecting YOUR vision for a sustainable, transit rich LA where you and your loved ones can thrive. 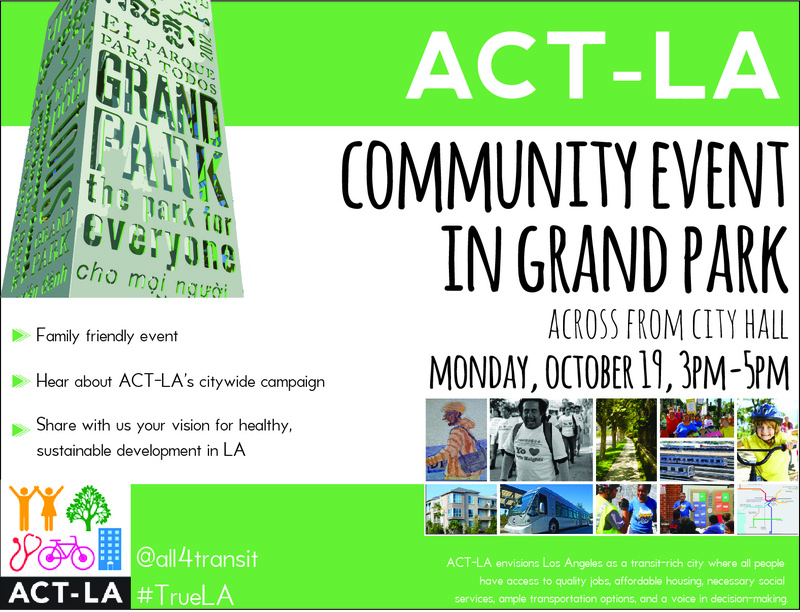 Join us in Grand Park, across from City Hall, on Monday, October 19, 2015 from 3-5pm. This will be a fun, family friendly event where you can get to know more about ACT LA and hear from speakers regarding the issues of affordable housing, economic development and sustainable, healthy infrastructure near transit.